I’m so glad you’re joining me for this coaching session today. If you have a problem even hearing me mention ‘self-care’ or ‘self-love’, then this session is for you! 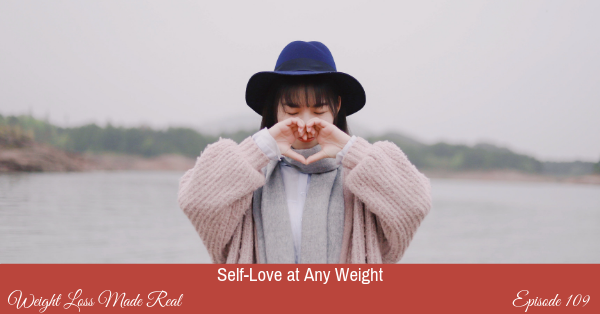 What do I mean when I talk about self-love as related to weight loss? Well, it’s all about the care you give yourself. I don’t even know what to do or how to do it! This is something other people do – not me. Does this sound familiar? Then you’re in the right place. I’m going to show you what happens when you don’t take good care of yourself. And how it affects not only your general level of contentment, but also your eating and your weight. So join me as I help you create a plan to build self-love into your life right now, no matter your number on the scale. I want you to learn what it takes to not only do it, but to feel worthy and deserving of self-love. You can do this, and this will make your weight loss journey easier and more pleasurable. I’ll see you in the session. 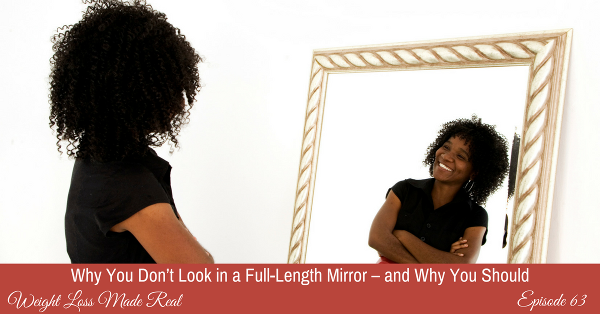 Do you own a full-length mirror? If you do, do you actually use it? If you have extra weight you wish you didn’t have, I’ll bet you avoid seeing the reality of how your body looks right now. When your vision of yourself is a bit fuzzy, you know that you’re not where you want to be, but you may avoid seeing exactly how off track you’ve gotten. Then one day, you may be shopping for clothes, and may be unable to avoid a mirror. Full-length. And that is when your reality meets your vision in your head and everything busts loose. Figuratively speaking, of course. I want you to be able to see yourself no matter what you weigh. Seeing and even accepting your body today is the key to a different body in the future. I promise. Let me coach you and show you how to deal with how you look. All of you. How well do you take care of yourself? If you’re like many women, you don’t do any self-care until something comes to a crisis point. You neglect your body until one day you wake up and don’t know how you got here. You may neglect your health until some symptom nags at you and won’t go away. And your emotional health is no different. You need to take care of you. There is no way around it. Here’s how we’re going to do that. Get my LOVE Menu worksheet right here. I want to show you how to figure out what you need. And stop resenting that you are in charge of meeting those needs. Then, I’ll help you create a menu of things you can do as needed so you feel good on a pretty regular basis. Ready? 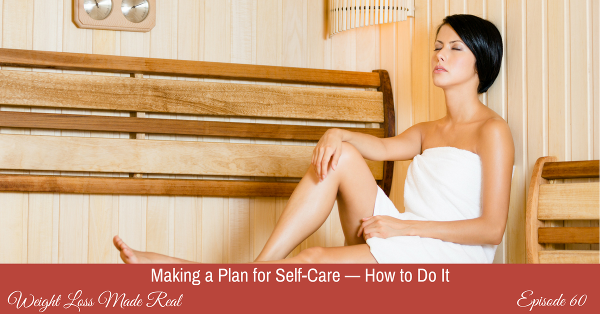 Let’s dive into creating your self-care plan. 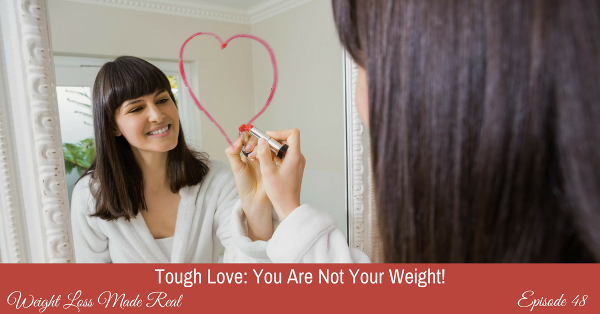 Episode 48: Tough Love: You Are Not Your Weight! Join me today for a tough love session. I want you to know how small your weight is in the big picture of you. Of who you really are. I know how much you worry about the number on the scale. And I know how you think you’ll be happy someday… when the scale tells you it’s okay. I will show you how to think about your weight and be happy right now. If you learn how to be happy no matter what your weight is right now, then your weight loss journey will be so much easier. There are so many more important and interesting things about you… much more compelling than what you weigh. Join me and allow yourself to see things in a different way. Together we can do this. Comments Off on Episode 48: Tough Love: You Are Not Your Weight! 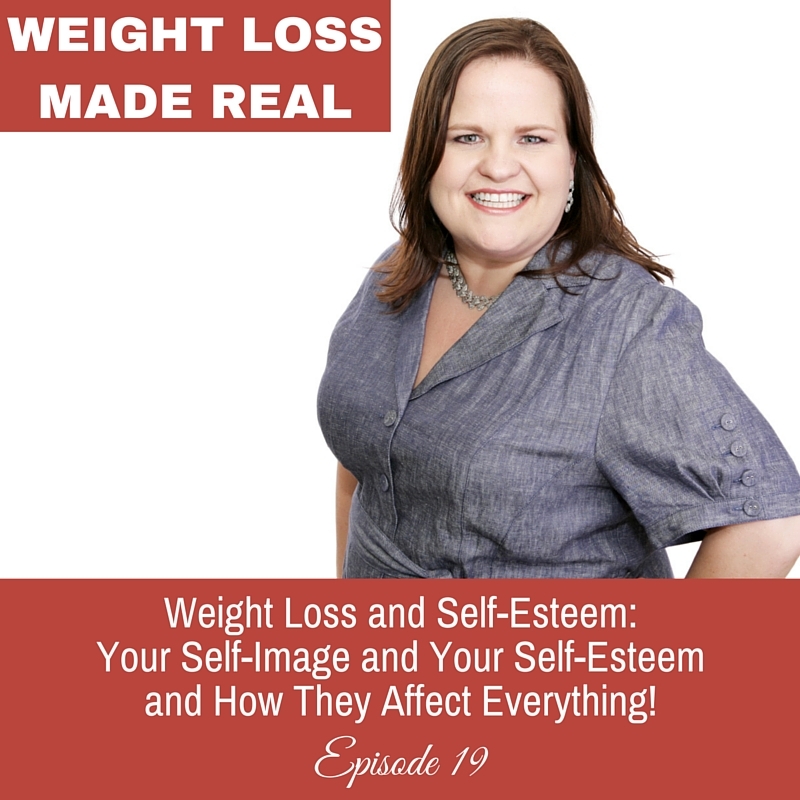 Episode 19: Weight Loss and Self-Esteem: Your Self-Image and Your Self-Esteem and How They Affect Everything! We all talk about self-esteem and self-image. We have a vague idea that these concepts play into how we feel about ourselves. But do we really know what they mean? Here’s the scoop about how your self-image and your self-esteem affect your eating and your weight. If you had a less than perfect childhood, (who didn’t?) how does this impact how you live your life today? Why you think highly of yourself. Or negatively. How to see the connection between your self-image and so many areas of your life. Why it’s simple but not easy to change your view of yourself. How your self-image shows up in how you take care of yourself. Or how you don’t! Did you think self-esteem was fixed? And unchangeable? It’s not, and here’s why. Exactly how to change your view of who you are in the world. How to rewrite your story about yourself and create a new direction for your future. Finally understand why it’s been so hard to reach your goals in all areas. Once you learn where your self-image and self-esteem come from, you’ll be able to look at yourself in a new way: with compassion and hope. And you’ll be able to stop thinking that things just are the way they are. Change is totally possible! 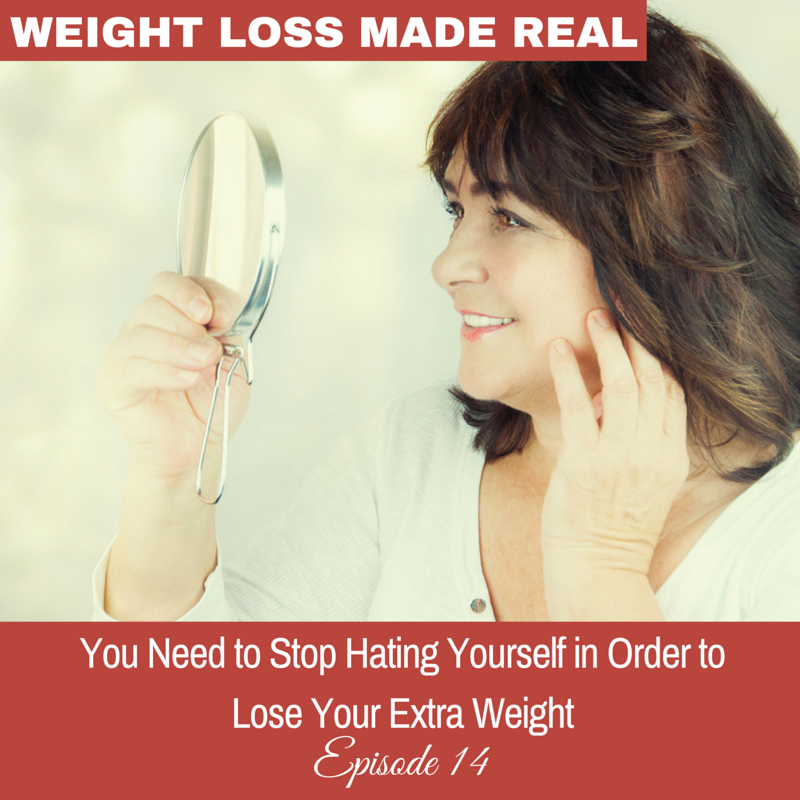 Comments Off on Episode 19: Weight Loss and Self-Esteem: Your Self-Image and Your Self-Esteem and How They Affect Everything! You want to lose weight. You want to stop your bingeing. And you definitely want to stop eating emotionally. But wait, before you can do those things, there is one thing you MUST do. And that is to stop the hating, the bashing and the name calling. That’s right! I’m talking to you, about those secret, internal conversations you have with yourself that leave you feeling terrible. And they make it impossible for you to take constructive steps to change the way you eat. How does your self-hate show up? What does it sound like for you? Why do you do it when it feels so bad? What’s the big deal if you talk not-so-nicely to yourself? If you need to feel better so you can do better, how exactly do you do this? What if your negative thoughts about yourself keep on coming? Do you think you’ll feel better AFTER you lose the weight? Why do the hateful thoughts about yourself feel so real? Changing how you feel about yourself at your current weight, with your current eating habits is something you can do. Definitely. 100%. Trying to make changes while hating your weight and your body and the way you eat will definitely get in the way. Let me show you how to change this and stop hating yourself, so you can move forward. Peacefully. A while back, a friend sent me an article she thought I might be interested in. It still stands out in my mind. It was from the New York Times, in the Health section, written by Tara Parker-Pope, entitled “Go Easy on Yourself, A New Wave of Research Urges”. The article talked about self-compassion as a critical ingredient needed for happiness, self-esteem, easy weight loss, and just about everything we all wish for in our vision of a good life. It cites research from the recently released book, The Self-Compassion Diet, by Jean Fain. Well, you know the old Golden Rule? Always treats others as you want to be treated yourself. This is a modification of that rule: Always treat yourself as well as you treat others. It may be, for many of us, the missing ingredient in getting ourselves to reach our goals. As I read through the article and the many comments it sparked, I noticed how many people felt that self-compassion was something we had enough of. Time to toughen up and do what you need to do. One of the comments on this article was from a woman who said: “No one in the world hates me more than I hate myself”. So let me ask you: If you make a mistake, do you berate yourself before moving on and correcting the mistake? Are you afraid you’ll be a worse mother, a heavier woman, a less efficient worker if you are nice to yourself? It’s seeing yourself without judgment, without disappointment or disapproval. It’s seeing your true self with clarity and honesty, and still feeling love for yourself. It’s being able to accept flaws in yourself without condemning. If self-compassion feels so good, why even debate it? Why don’t we all have busloads of self-compassion all the time? It’s because we fear that if we aren’t harsh and critical, we’ll just go off the deep end. But here’s the deal: Being compassionate toward yourself is not the same as feeling sorry for yourself. Feeling sorry for yourself keeps you stuck. Feeling compassion is like putting a cozy blanket of comfort around you, and saying, ‘You’re ok’. It doesn’t hold us back from our best work, or from our best self, or from our best habits. It fills our cups, letting us move forward. It’s always easier and feels better when we move from a place of love, and understanding. Not needing to fill ourselves up with things that don’t quite do the trick. Like brownies, when you’re lonely. And chips when you’re overwhelmed. So, what’s the trick to feeling self-compassion? 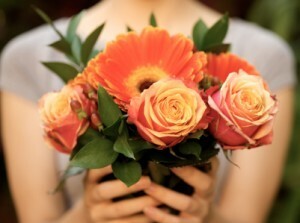 When something goes wrong, pretend that your most beloved friend was responsible, instead of you. How would you talk to her? When you are doing something that isn’t in your best interests, rise above the scene. Look down at yourself on the ground. And remind yourself of your big game plan. When things aren’t perfect, remind yourself that you’re not alone. We’re all human, we’re all in this together, and we certainly all screw up. So there. If having self-discipline sounds like the most boring, toughest thing you can do, and don’t want to do, then you need to listen to today’s podcast. When you think of self-discipline as the most loving thing you can do for yourself, you’ll be taking care of yourself on a whole new level. Why you rebel against disciplining yourself. What self-discipline really means, and what you mistakenly think it means. 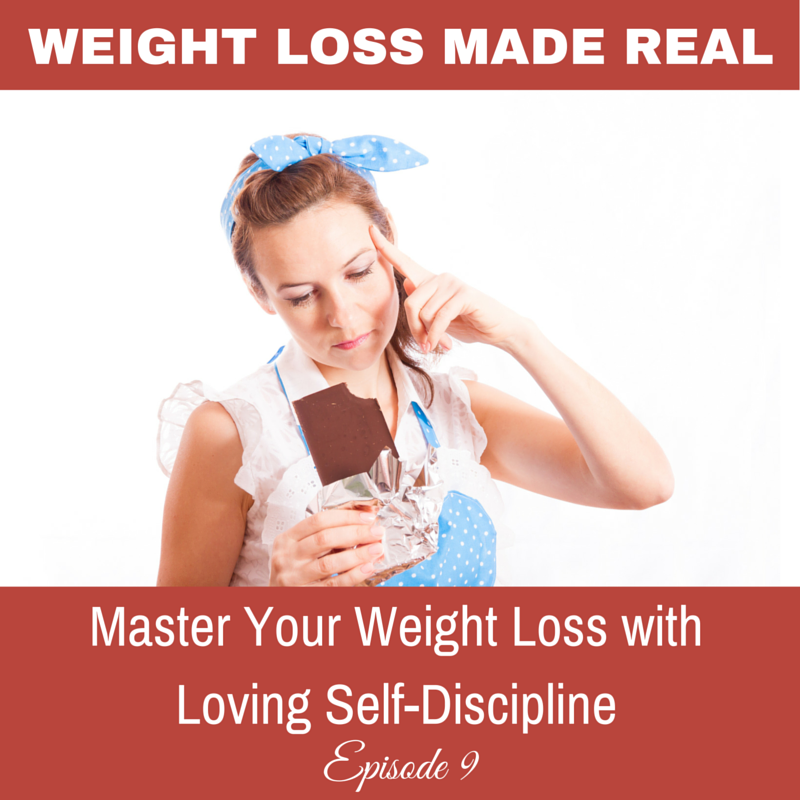 How can you make self-discipline feel good? What does it look like in your everyday life? How can you create it in relation to your eating? What steps do you need to take to make it feel easy and natural? And how can you bring self-discipline into your life without dread and resentment? All these questions are answered in this episode and more. Saying ‘no’ or ‘wait’ to yourself doesn’t feel as bad or challenging when you know why you’re doing it. The goal isn’t to force yourself to do what’s right for you, but to want to do what’s right for you. It’s all about creating rules for yourself that feel like love, not pain, and not hate. Did you ever hear artists or writers talk about their ‘body of work’? It’s what they create, what they contribute to the world during their lifetime. I’m not an artist. But I do consider that I have a responsibility to my body of work. What’s my body of work? Because all that I am profoundly affects those I am connected with. I believe that my life matters. It’s the vehicle from which I contribute to the world. And my contribution is important. Your contribution is important too. Maybe you’re not sure exactly what your contribution is. Just by being in this world, you are having an effect on all people and things you come into contact with. So the way I like to look at it, is that YOU are your body of work. Your brain, your ideas, your feelings, and your physical being. You house the essence of you. 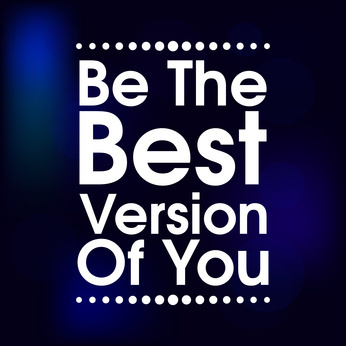 And you owe it to the world to be your best. So if you feel like it doesn’t matter what you do, or whether you take care of yourself or not, or that being your best isn’t worth the effort, you are wrong, my friend. You are your body of work, and it all matters. What do you want to work on to be your best? When I ask my friends and clients this question, their answers vary. They vary based on how they are feeling that moment. If they are feeling pretty good about themselves, they generally like what they see. Even if they have a few extra pounds on them, their focus is on what they like. They notice their hair, their sparkling eyes, their posture, and their cute outfit. If they are in the midst of a war with themselves, their focus goes right to a ‘problem’ area… they focus on their muffin top, their thighs, or their full face. Did you ever notice that when you are feeling good, everything feels right? You get dressed and put together for the day, and you’re generally happy with what you see. The very next day, however, could be a totally different story. Same person. Same life. Same body. And yet on the next day, you could be putting all your focus on every possible perceived flaw you have. And what you put your focus on grows. How could you be happy with how you look one day and not happy, in fact miserable, the very next day? You don’t change in one day. But your thoughts change constantly. And it’s your thoughts that need to be cleaned up before you make any changes in your physical body. Look in the mirror and notice what comes up. If you feel good about what you see, don’t stop there. Dig a little deeper and unearth the thoughts you are thinking that are making you feel good. If you bring them to the surface, and collect them, you can bring them out again on a day when you’re struggling a bit. And on the days when nothing feels or looks right, bring up those thoughts too. Only these thoughts we won’t be collecting. We’ll be reviewing them. Seeing if they make the cut. Will you be keeping these thoughts? Only thoughts that make you feel good are allowed. The image in the mirror doesn’t change overnight. And the good news is, you’re in charge of your thoughts. So what you need might not be a diet, or a new outfit, or a personal trainer. Perhaps what you need is a bunch of kinder thoughts. Mirrors give us back a reflection of what we are putting out there. That includes our thoughts and our feelings. 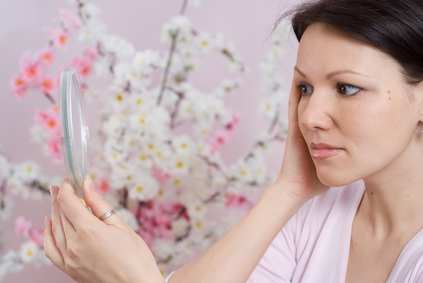 That explains why we can feel good about what we see in the mirror one day and not good the very next day. Return those crappy thoughts and pull out the good ones. After all, you’d return pants that weren’t flattering, right?